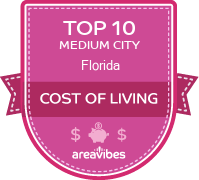 How Do You Rate The Livability In Cocoa? Two Islands at Then the Ocean! I wish I had discovered Cocoa in Florida long before I relocated to the region for work. Cocoa is along the central east coast of Florida, but we have two barrier islands and rivers separating us from the Atlantic Ocean and those white-sand beaches. Living in Cocoa is all about enjoying the beauty that is the Sunshine State, and I take advantage of every amenity in the region on a daily basis. The best areas in Cocoa are near the water. Right over the bridge, I can visit the Wildlife Sanctuary, then one more bridge to Cape Canaveral. On a clear day, I can see and feel the rockets blasting off from their launching pads at the base. My home is in a quiet neighborhood where the people all look out for one another. Cocoa Beach is iconic, and I can walk or ride my bike there every day if I like. Shopping and dining are all incredible here, a little something for everyone. Source: The Cocoa, FL data and statistics displayed above are derived from the 2016 United States Census Bureau American Community Survey (ACS).